Richly-textured paneling that enhances the depth and beauty of the fine woodwork in Biltmore House inspired our classic Amherst Collection. 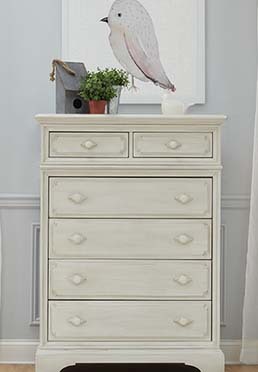 Each piece features design elements drawn from the Library and Music Room, while the Chest and Dresser are further distinguished by striking, diamond-shaped pulls similar to those in Mr. Vanderbilt’s Bedroom. This handsome collection offers a firm foundation for generations of your family. The Amherst Collection is available exclusively at buybuyBaby.